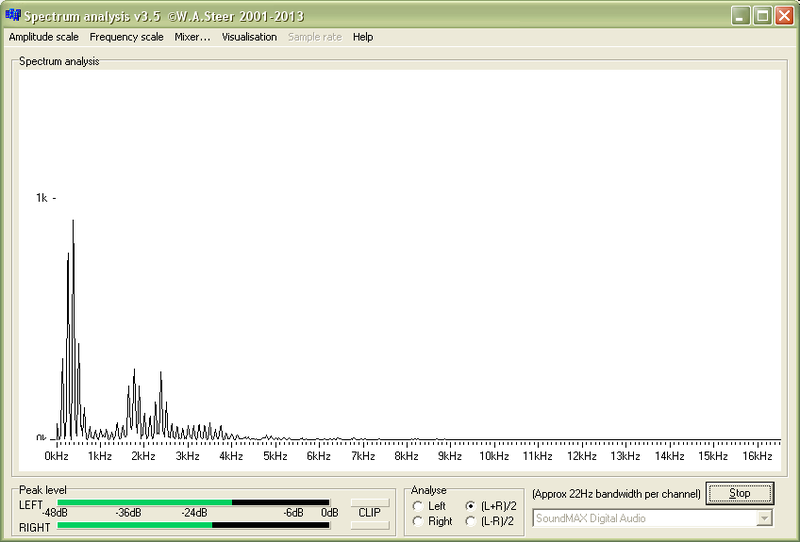 This page describes a free audio spectrum analyser which you can download. It uses fast Fourier transform (FFT) to give a real-time ('live') spectrum display on your screen. Runs under Microsoft Windows 95, Windows XP, Windows Vista, Windows 7 and newer. Samples an audio stream in 16-bit stereo, then uses a Fast Fourier Transform to yield the spectral analysis in real time. Bargraph peak-level indicator shows time-domain peak levels and onset of clipping distortion (spectrum also goes red). Supports multiple 'wave input' devices (multiple soundcards, and/or the newer Windows Vista/7 sound model). Spectrum obtained using FFT with Hanning (raised-cosine) window-function. Implemented correct 'A'-weighted displays (rather than Fletcher-Munson/Terhardt). Now optional for all visualisations. Vertical scale calibrated as fraction of digital full scale ('FS') with currently-set mixer-settings etc. Choice of horizontal (frequency) scales, including a logarithmic 'perceptual' scale. Spectrograph (waterfall) visualisation options (experimental/beta feature). In older versions the perceptual "A-weighted" is not actually A-weighted, but is modified by the hearing threshold according to Terhardt - see http://www.diracdelta.co.uk/science/source/t/h/threshold%20of%20hearing/source.html. Versions 3.8 onwards use actual A-weighting. Use lookup tables to improve program efficiency for any displays using log calculations! Horizontal scroll option to allow close-up inspection of a narrow part of the spectrum. Download: SpecAn_3v97c.exe (564kB) latest version 3.97c - 16 July 2016. New in this version: improvements to ability to export numerical data (time-average FFT) to clipboard, new third-octave band analysis, Mel-band analysis, and other minor tweaks. Download: SpecAn_3v93.exe (553kB) previous version 3.93 - 29 April 2016. Download: SpecAn_3v91.exe (550kB) older version 3.91 - 29 August 2015. Download: SpecAn_3v5.exe (532kB) much older version 3.5 - August 2013. By downloading any of these files, you consent to the standard disclaimer. This applet doesn't require any installation, won't touch your Windows Registry, and won't install any DLLs. Just download the .EXE and run it. There's no bundled adware or unwanted toolbars. It'll even run straight off a USB memory stick if you want.